I fly in and out of Dallas from its originally airport, Love Field -- where President Kenndy''s Air Force One landed and departed on his deadly visit here in November 1963. I was 26 months old. A year younger than the President's son. I don't remember the assassination itself, but watching the funeral on TV is my first real memory. My mother had taken us to visit her dear friend, Pat Regan, at her tiny Cape in downtown Old Saybrook, CT.
Pat had all the shades pulled down in her living room, creating a deep gloom around her black and white TV. She and my mother sat at the kitchen table just outside the doorway to the room, where they could keep an eye on where they allowed me to sit, transfixed, before the ghostly, flickering screen. The gray images were vague and shifting -- more dream than reality. The dark, riderless horse with its backward facing boot is the image most lodged in my memory. John John's sad, obedient salute. And my mother and Pat crying behind me. I didn't understand then what had happened, but I knew it was very sad and ran to hug and be held by my mom. It didn't take me long to understand. My generation was raised in the shadow of political assassinations. Within four years, four of our progressive leaders -- those trying to transition us from the World War II generation to a new era in which our nation might build its own equity across race and gender and spread its immense prosperity to create global equity as well -- were gunned down. Malcolm X (1965). Martin Luther King, Jr. (1968). And Bobby Kennedy (1968). The second Kennnedy death sent progressivism reeling -- not knocked out, for the anti-war and feminist and desegregation and gay liberation movements continued. We have continued slowly on our evolutionary path to consciousness as human beings. But our leadership was significantly derailed and has yet to fully recover. Rather than a President encouraging our leadership and engagement and philanthropy and giving voice to hope -- "The American people expect more from us...For the world is changing. The old era is ending. The old ways will not do..." -- we got a President who resigned before he could be impeached for obstruction of justice around criminal attempts to influence an election in his favor. That was in the 1970s, yet today we find ourselves in an oddly deja vu situation, with a "mob boss" style President fearful that if held accountable for his dishonest tactics then the legitimacy of his presidency will be in question. As it is and should be. It is Easter weekend and the beginning of Passover. The memory of our nation has much for which to seek reconciliation and to make amends. When will we give up our addiction to those who will lie, bully, and strong arm voters to maintain their power and move fully and joyously toward these different values? The memory of our nation is one of white brutality. One cannot travel across these beautiful prairies without mourning the wanton destruction of its native inhabitants. The U.S. Army used "total warfare" to wipe out the tribes, their horses, and their sacred sustenance: the buffalo. "Total warfare" included the use of many tactics that would be prosecuted as war crimes today, from dawn raids on sleeping villages of non-combatants to the decimation of food sources to starve entire peoples. Kennedy was no saint. He, too, was a child of privilege and he, too, felt entitled to use his privilege to his advantage. Yet at the same time he also understood his privilege as a duty to make the world more fair and prosperous for others. He made plenty of mistakes in this work -- seeing Communists everywhere as the enemy and engaging U.S. Troops accordingly, for instance -- but his enduring legacy is to ask each of us, and especially America's young people, to ask "not what your country can do for you, ask what you an do for your country...ask not what America will do for you, but what together we can do for the freedom of man." When I was growing up in the 1960s and 1970s, art was everything to me. No matter how small or how ill fitting or unsafe my family's world seemed to me to be, I was able to move beyond it by plunging my nose into a book, listening to or playing music, picking up pen and ink and drawing. I was one of the lucky ones. While I was one of millions of babies in the post-WWII era born into traumatic circumstances and given up for adoption, I landed in a loving home: a white, round-faced, red-curled baby with plenty of meat on my bones in the U.S. during a time of great prosperity. Azam Ali and Loga Torkian of the Montreal-based music ensemble Niyaz were not so lucky. 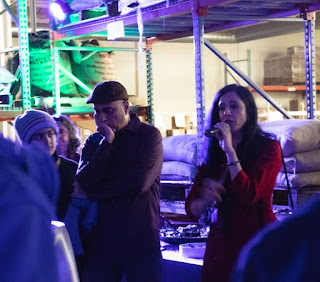 As children, they became, as Ali said during a reception last night at Coffee by Design in Portland, “forced immigrants” thanks to the Iranian Revolution. Few Americans understand the long-standing world tragedy represented by the western colonization of Iran for oil. Iran is the former Persia: a country of great geostrategic importance, yes, given its size and location and petro-resources — and more importantly home to some of the world’s oldest civilizations. Persians were once referred to as the "first Historical People" -- because the empire they ruled from Persepolis was the largest the world has ever seen, connecting over 40% of its peoples. 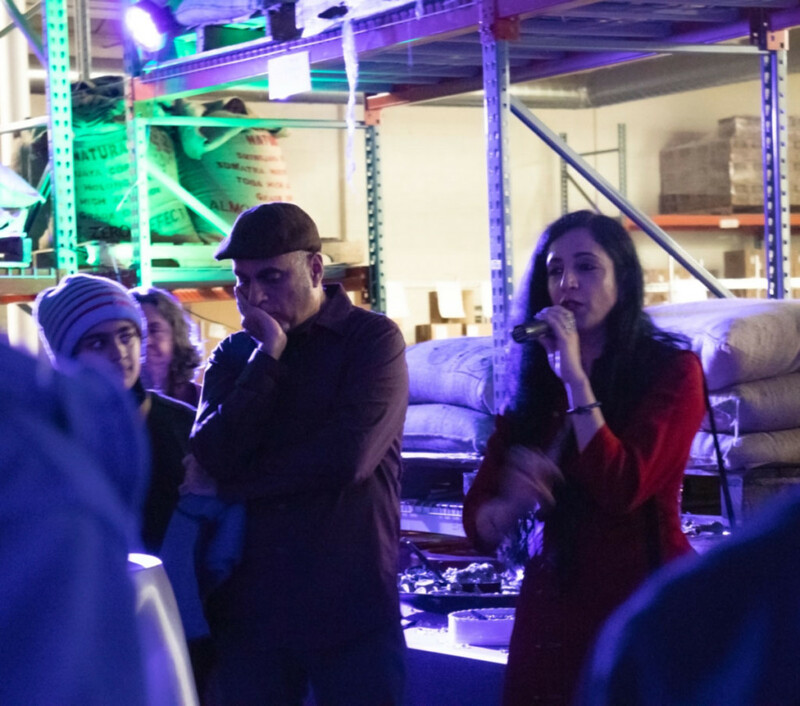 Niyaz's music -- a part of Ovations' "Seeking Resonance" series exploring artists and art inspired by or connected to spirituality -- will take us to these many, many worlds outside of Portland. The band has, in their own words, "created a 21st century global trance tradition by seamlessly blending medieval Sufi poetry and folk songs from their native Iran and its surrounding countries in the Persian Gulf, with rich acoustic instrumentation and state-of-the-art modern electronics." 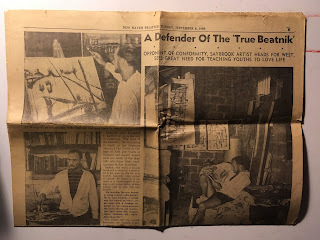 "Art became the homeland that we no longer had," Ali said. She believes it is art that can connect us in our increasingly global and secular societies. "To thrive in a secular society," she said, "Art becomes the shining light. Art is where people go to church." Ali and Torkian's families, like so many world citizens, were forced to take a leap of faith and leave their homeland. Mary Allen Lindemann, CBD's vibrant founder and an Ovations' board member, opened the evening by reading a poem written for her by a local poet: a woman who types her poems on an old-fashioned typewriter while sipping coffee at CBD. "...we are all on our way somewhere./how can we know/how can we know where the wind,/i mean water, will carry us." wrote Katherine Ferrier on February 14, 2019 in "Leap of Faith." How can we know. Where do we each find our resonance. "...sometimes the practice is to leap/to leave what we know/and let the world open us/until we are river, and the sea/ that welcomes all wandering water/back home," Ferrier concludes her poem. Often we have to leave what we know to find ourselves welcomed anew. Portland Ovations was proud to present Niyaz at PortCity Music Hall last night, March 15, 2019. For more information on the ways Portland Ovations brings the world to Portland and home back to many of its peoples, see www.portlandovations.org. The Trocks are Coming, the Trocks are Coming! MONDAY, MARCH 4--Last night I got to do something I love to do: sit in the dark, surrounded (mostly) by strangers, watching a movie. It is especially lovely to do this -- what feels like such a commonplace luxury -- in a small venue and community like Portland's SPACE Gallery. Having handed out show info, greeted patrons, and introduced not only the film but the film's raison d'etre -- the Trocks are coming! the Trocks are coming to Maine via Portland Ovations! March 28 - 29 -- I'm sitting in the second row alongside a colleague who happens, similarly to the movie's subjects, to be a dancer who is also an excellent comedian. We've both cried four times at least during Rebels on Pointe, a documentary of Les Ballets Trockadero de Monte Carlo -- the first documentary, in fact, of this notoriously fun and skilled male drag ballet company founded over 40 years ago, rising out of Stonewall and Charles Ludlam's Ridiculous Theater Company. Any evening on which you are moved to tears multiple times by art is a great night. I can't remember now all the scenes that moved us to tears; there were many. Maybe one time it was the young, beautiful dancer from Cuba (Carlos Hopuy) describing how he and his family (and, basically, everyone) were starving during the 1990's; and how much he wants his mother, also a dancer, to be able to get out of Cuba to come see him dance. Maybe it is the sweet faced dancer-turning-educator as he heads into his 40's, going home regularly to northern Italy between tours to visit his dad, who has Parkinson's disease. Maybe it is when the first young Trocks couple gets married -- something neither Trocks' Artistic Director and retired dancer Tory Dobrin nor I thought we would ever see in our lifetimes. Most likely for me, it is when Dobrin talks about losing half the company to AIDS during the epidemic period of the 1980's-90's -- including his own partner. I remember too well when gay men were dying all around us, every day. And that's one of the amazing things about the Trocks: their history spans a remarkable 40 years of gay history as an integral part of their own. The up's and down's of the dancers, the support of their families, the company's growth and evolution, their rock star status in Japan: it's all within the context of queer history and male dancers in drag satirizing one of our most elite performing arts forms -- ballet. The comedy and satire the Trocks bring to ballet ironically "normalizes" what has become, for too many, an inaccessible form. They bring ballet down to earth both with their incredible skill on pointe and their commentary on the form itself -- and of course, their humor. Broad understanding is best fed by laughter. 12 p.m., University of New England: Aging with Grace and Movement -- Health Challenges Faced by the LGBTQ Community, a collaboration with UNE and SAGE. FREE. Freddie (Endrich, Jr.) was my mother's most beloved first cousin. She adored him. He called her Maisie, and bought her daybooks every year, in which she faithfully recorded the weather, as well as whether or not my father or brother were at home. When I was growing up, during the 1960's and 1970's, Freddie was the most gentle soul I knew. He sported a thin mustache above his ever-amused lips, and a beret. 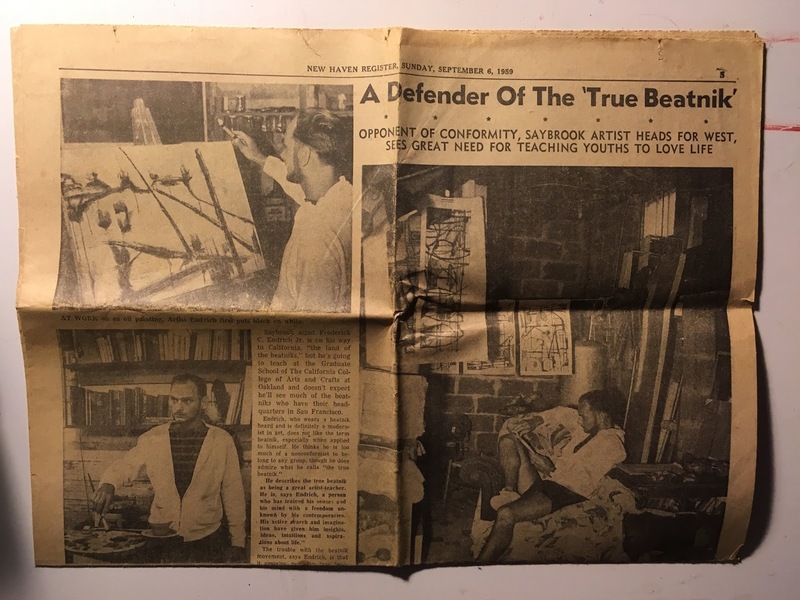 In 1959, our statewide paper called him a "beatnik" and reported on how he wished to conform with no one. Unlike the rest of the men in his German family, he spoke in a soft tenor. And he was educated: not only had he been to college (his father, a plumber, had a sixth grade education like most of our family from that generation) but he had been around the world, serving in Korea, teaching at the American University in Beirut for many years. He brought me home a copy of Aesop's Fables from that sojourn, a book I held, and will always hold, dear. The tortoise and the hare?! The lion and the mouse?! Freddie loved my long, 1974, 13-year-old platinum hair. Somehow I had genetically mimicked the Swede who had adopted me, while with its length rebelling against parental authority all in a single act. Freddie took it as a sign of my Bohemian/artistic temperament. I was his, and he was mine. I just gotta get out of this prison cell, one day I'm gonna be free: find me somebody to love. Freddie had a former tenement house in the Lower East Side, south of Houston, which was a slum when I moved there in the mid-1980's. It's difficult now for people to envision NYC as it was then; so much dirt, so much crime, so much violence. The building in which Freddie lived with Basil and their twin dobermans and monkeys-in-the-shower recently sold for millions of dollars. It makes me laugh until I cry -- and I know it would him, too, if he were still around. 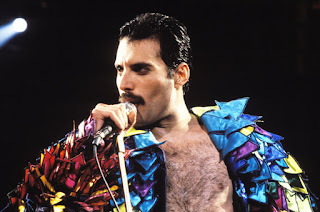 Freddie died of AIDS on February 12, 1988. He was 58 years old. He'd been gay for as long as any of us had known him, bringing his partner, Basil, to Christmas at my aunt's in New Jersey where he knew he'd be tolerated by a Catholic family focused on love. I couldn't find an obituary for him, and I am trying to locate his sculptures and papers in light of the recent death of his younger brother. 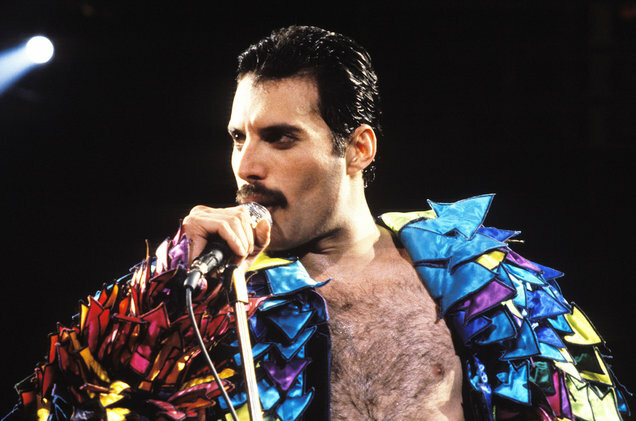 Freddie Mercury -- like my Freddie, a queer man who lived on the cusp of a transitioning society -- died of AIDS three years later, in 1991. There was no telling, in those days, who would die when. Some of those diagnosed died within weeks or months. Others are still here, amazingly and against the odds, to tell the tales. This year's Oscar-nominated film for Best Picture, Bohemian Rhapsody, tells Mercury's tale remarkably well, and re-plants the band's splendid glam-rock ear worms in our heads where, with luck, they live on as reminders to us all. The holocaust is not over, with more than a million people around the world dying of AIDS every year. And there is something about Bohemian Rhapsody, as a song, that always felt eerily prescient to me..."sends shivers down my spine/body's aching all the time...gonna leave you all behind..."
But life still goes on, I can't get used to living without you by my side. I don't want to live alone...I've got to break free. I moved into the queer world of NYC in 1985, my partner Kathryn and I staying with Freddie and Basil on Eldridge Street and also at their cottage in Cherry Grove. We had stepped into a holocaust. Our pretty, smart, creative and beloved boys were dying every hour of every day of every week. Our lives were filled with visits to St. Vincent's and memorial services. But when my Freddie died, his illness was kept under wraps. I did not even get to visit him in the hospital. Suddenly, he was gone -- like so many others. We cannot count the dead they are so many -- but we can remember them. I remember Freddie, his soft voice, his intellect, his laughter, his desire for pleasure and for joy, his sculptures made of neon light. Freddie wanted us all to be free. And we can continue our fight for a future in which the Freddie's do not die in their quest for pleasure and freedom. These are our birthrights as humans, challenging to achieve though they are; and it is not god who punishes us in our quests for them. Long live our struggles for pleasure, and for freedom. Long live Freddie Endrich, and Freddie Mercury. I am so grateful to you both. Close to 50 years ago, Neil Armstrong was the first man to land on the moon. This landing — only the first of six that occurred between 1968 and 1973 — is an all but forgotten scene from American history. It’s importance to us lies more in its context than it what it achieved. The “one small step for man…one giant leap for mankind” and President Kennedy’s desire to prove that Americans could do things precisely because they are difficult fell prey to a meaningless yet deadly war in Vietnam; a string of political assassinations of progressive leaders; race riots; domestic bombings and the National Guard shooting of students at Kent State; President Nixon’s impeachment and resignation — and most recently to reality TV. The “space race” was just that: an hubristic enterprise by white American men, spending billions of dollars of public money to beat their Russian counterparts to the moon while America burned. African-American musician Gil Scot-Heron captured the sentiment at the time with his poem and song, “Whitey on the Moon:” “I can’t pay no doctor bills / but Whitey’s on the moon… / No hot water, no toilets, no lights / but Whitey’s on the moon…"
Armstrong’s landing might have imbued us with a reverence for our planet and its solar system. Instead, it became just another victory march for white Americans, plowing forward, as Armstrong’s wife Janet says (her fear-based anger well portrayed by Clare Foy in “First Man,” the recent Damien Chazelle film epic of Armstrong’s flight, now playing at Opera House Arts), like “boys with balsa wood toys.” The program persisted through loss after loss of astronauts killed as test pilots and, most famously, three burned in their capsule before the takeoff of Apollo 1 in 1967. After which, we were rewarded with many shots of other astronauts planting the flag -- along with a bit of scientific research. There just wasn't much to find on the moon itself. 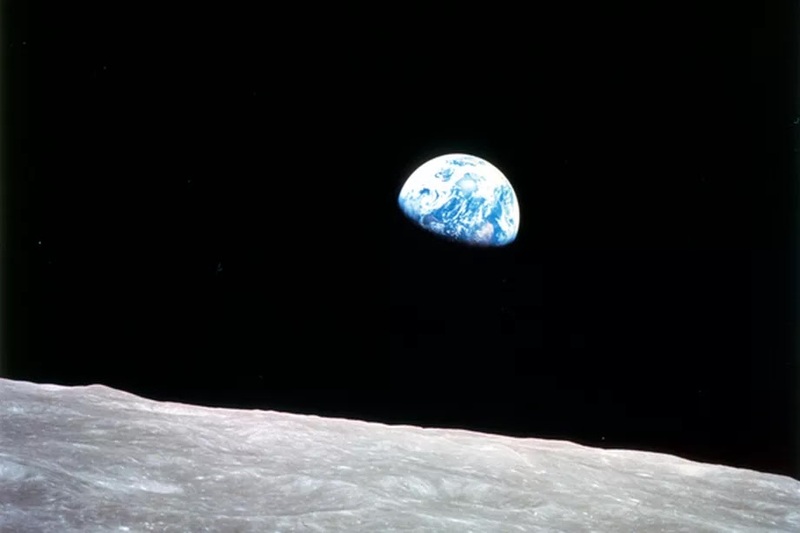 As Armstrong put it before he even went, what we might get was, at best, most likely to be a clearer picture of ourselves in context from outer space — one we perhaps should have had already. Armstrong himself came back from his first flight beyond the atmosphere in amazement at how thin it was. That was 50 years ago. Little did he know that oversized U.S. fossil fuel consumption would make our atmosphere even thinner and more fragile in the years to come. Despite the awe and positive impact sparked by the Apollo voyages' famous “blue marble” image of the earth from outer space, we’ve continued to exploit the planet more than steward it. We've continued to be distracted by political mayhem, and remained unable to invest in solving the problems of the most needy right here in our own country. In all of this, we follow in the all-too-large footsteps of that first “whitey on the moon." Interested in community development? The arts? Public education? Democracy? This is the place for you. Follow Isle Storm through the in's and out's of life as the Assistant Director for the Maine Arts Commission, the founding producing artistic director of an historic theater on an island off the coast of Down East Maine . . . and in many other locales as well.